As I was cruising the Best Books of 2011 lists that have come out in the past few weeks I came across a recommendation for Wildly Affordable Organic by Linda Watson. The book grew out her experiences taking The Foodstamp Challenge to see if she could feed her family healthy, organic food on a food stamp budget, then $5.49 per person, per day in her home state of North Carolina. Having noticed how much more expensive (and heavier) my grocery bags have become since going paleo, my curiosity was piqued. One click and a few days later I was the proud owner of a copy. The first thing to note about the book is that Watson is a vegetarian, so if you’re hoping for secrets to buying and storing free range meats affordably, look elsewhere. Her reliance on pasta and vegetables for most meals goes a long way in stretching her budget, making the sample menus and recipes included largely unsuitable for paleo tables. Still, she does offer great information about how to freeze and store nearly any fruit or vegetable. Much of this will be familiar territory for the farmers’ market set, but there are plenty of good ideas and inspiration to go around. For my own part, I really rethought my freezer situation after reading Watson’s book. In general, my approach has been to view the freezer as storage for my frozen veggies and the last-ditch repository for any leftovers that have been sitting in my fridge for a week and no longer interest me. 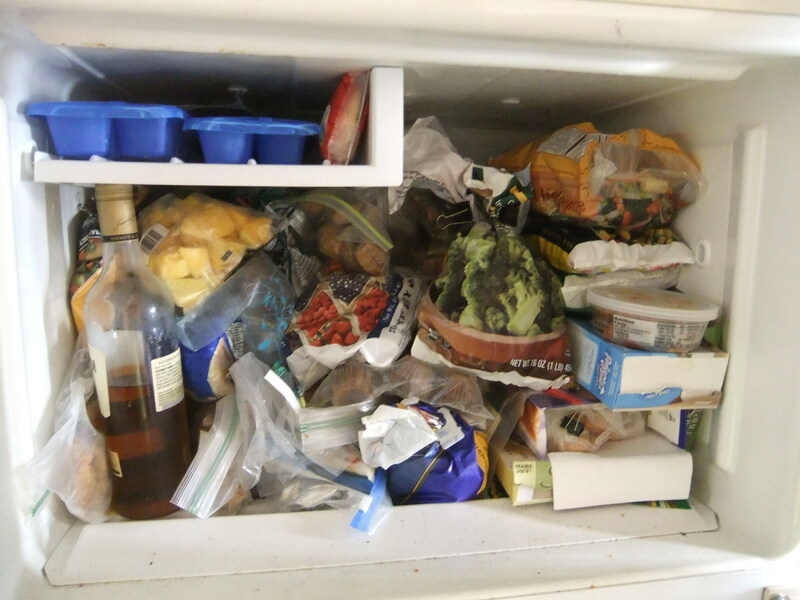 My freezer is also rather small and has no shelf, so the result is a cold, jumbled mess where things disappear for months until they eventually fall out and hit me on the foot. If I’m lucky, it’s a bag of broccoli. If I’m not, it’s a frozen turkey breast. Watson, on the other hand, advocates a tidy system in which everything is stored and stacked in labeled Zip-Loc bags with the air removed by means of a straw. 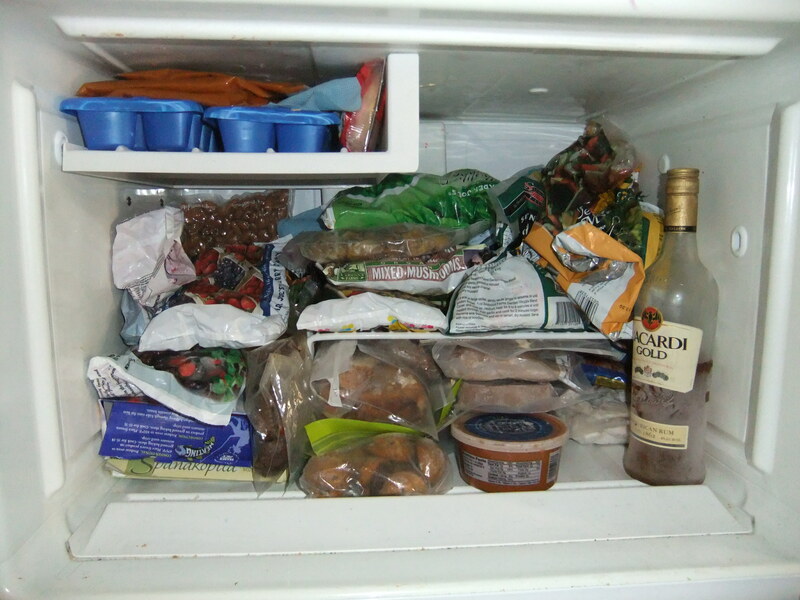 While this utopian view of an organized freezer totally hooked me, I could not reasonably imagine myself dutifully sucking air out of bags with a drinking straw, particularly when raw meat was involved. 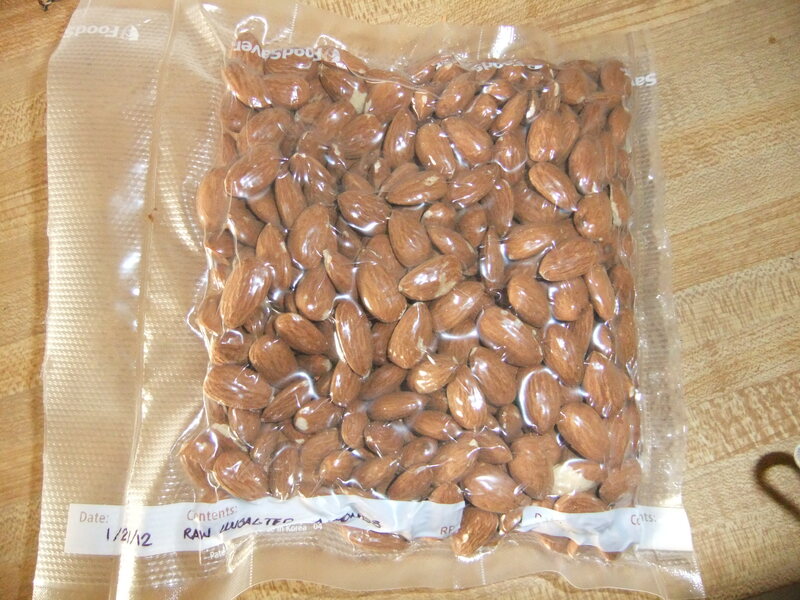 Back to Amazon I went and ordered a vacuum sealer and a supply of bags. I also hit Home Depot and picked up a small wire shelf (the type used for stacking plates in a cupboard), preparing to implement a two-tier system for organization. A few days later, the vacuum sealer arrived, and I found myself simultaneously excited to execute my grand freezer plans, and moderately ashamed of that excitement. Stage one was to empty everything out, identify what I could and throw out what I could not. There were plenty of pre-paleo purchases still languishing in the back of the freezer, along with many Zip-Loc bags full of what appeared to be snow balls. After weeding through everything, categorizing into animal, vegetable, or unidentifiable, I began the process of repacking and stacking. 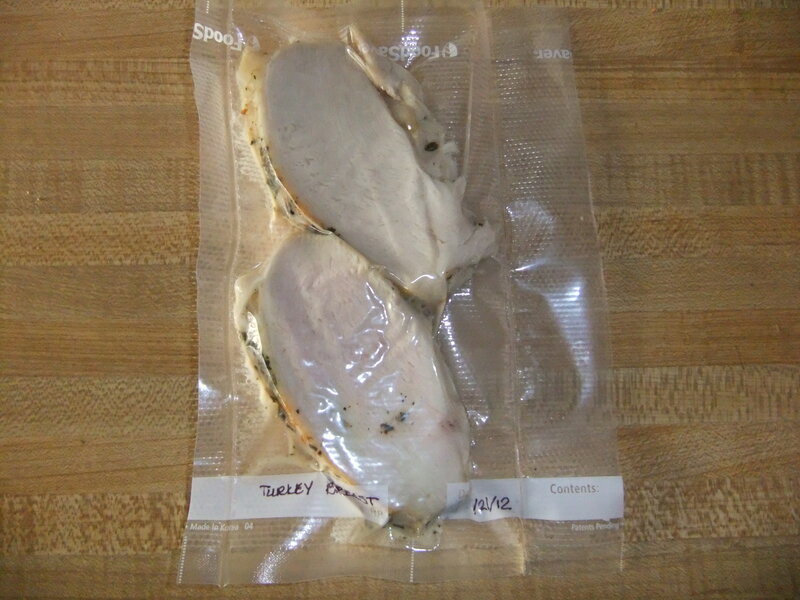 I plugged in the vacuum sealer and went to work. I had chosen the Rival model based on the Amazon reviews, which at $40 seemed like a good investment. It’s a compact machine and turned out to be quite easy to use. After about 20 minutes I had managed to get all of the longer-term storage items repackaged and sealed and was debating putting my Han Solo action figure into Carbonite freeze. As I see it, there are two big advantages to the freezer project. First, I won’t lose nearly as much food to freezer burn, which should save considerable money and frustration. Second, I can repackage food into single-serving units, eliminating the problem of having to defrost 3 days’ of chicken thighs at once. I’ve always tried to freeze food so that it wouldn’t stick together in a big lump, but inevitably something in the freezer would shift and I’d be left with a big mass of turkey burgers. The real bonus, as I realized a few days later, is guacamole. Guacamole, elixir of the gods, is really one of the great casualties of living alone. There’s just no good reason to make guac for one. Until now, that is. I can whip up a batch, vacuum seal it, and eat it for days. In the same vein, it occurred to me that I can also take apple slices for snacking on the plane without worrying about them turning brown. I also made a batch of Elana’s Paleo Gingersnaps, now safely packed and stale-proofed for shipment to the Caveboy. 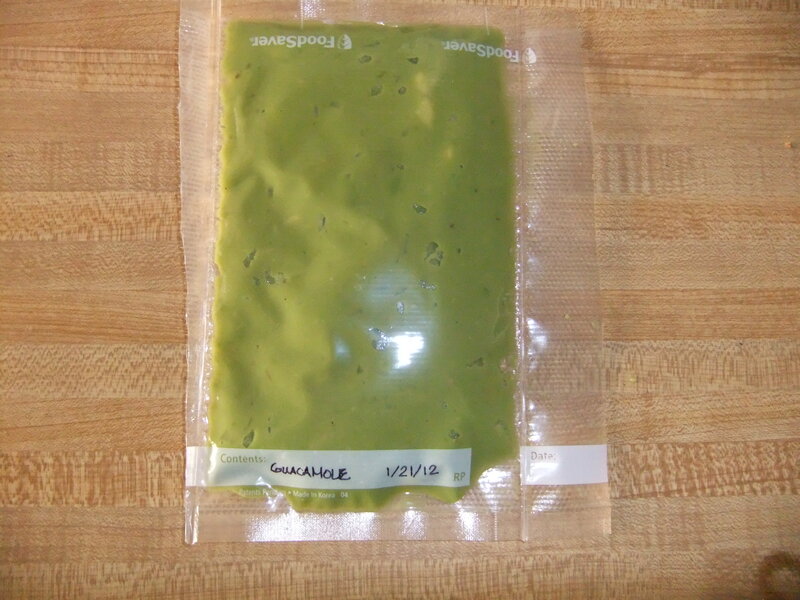 Part of me feels like a vacuum sealer shouldn’t improve my quality of life this much, but then anything that facilitates ready availability of guacamole is worth serious consideration. In a fit of unbridled optimism, I had hoped to get this post, as well as a recipe for Paleo latkes up last week, but it seems that family and travel demands intervened. I still may try for a post-Chanukah stab at the latkes, but now that the family and house guests are gone it puts a lot of responsibility on me as solo recipe-taster. More on that situation as it develops. Well, it’s the first week of January, that most dreaded of seasons for the devoted gym rats of the world. I am bracing myself for the annual overcrowding of the parking lot at the Y and having to fight newbies for treadmills. Those are minor inconveniences, but unfortunately, it’s also the season of listening to cell phone conversations held at a volume sufficient to overcome the noise of the elliptical machine workout that the speaker is, appropriately enough, also phoning in. I’m all for New Year’s resolutions, and I applaud anyone making an effort at self-improvement. I just ask that you read the gym rules (I guarantee they’re posted somewhere), and wipe off the machines when you’re done. To business. Let’s assume you’ve decided to take the plunge into Paleo and you’ve even read a book or two on the subject. In my last Food for Thought post I recommending going through your cookbooks and finding the recipes that are either already Paleo, or good contenders for strategic substitution. I think this is a good starting strategy for a couple of reasons. First, it demonstrates that going Paleo doesn’t mean that you have to completely abandon the food culture you enjoy. Many traditional dishes are just fine, or can be made so with a few tweaks. Second, if you enjoy cooking (and let’s hope you do, because you’re going to have to start doing a lot of it), you might find some of the Paleo recipe sources a little austere. Don’t despair, though. You are not confined to a life of nothing but grilled bison and baked fish with—hold onto your hat—lemon squeezed over it. There are a number of great Paleo cookbooks available, but as before I’m going to recommend starting with what is most readily available—online resources. Happily, there are a great many out there, but a few stand out to me. Health Bent has my favorite tagline—“Paleo-friendly recipes that don’t look or taste like dog food,” and they more than deliver on that premise. They have a foodie take on Paleo and their recipes are pretty and tasty enough to serve to company (even Normals). The Foodee Project is also a great resource for primal recipes of a sophisticated bent. I also really like The Food Lovers Primal Palate, despite their missing apostrophe. I was thrilled when Elana of Elana’s Pantry went Paleo this year. It started out as a gluten-free blog with really wonderful recipes for wheat-free baked goods, many of which can easily be made more primal. I love baking and when I first went Paleo I found her recipes to be a helpful transition to a less flour-laden life. Lately I’ve been putting more energy into cooking and less time into baking, but I still indulge in the occasional gingersnap or Paleo dessert courtesy of Elana. There are, of course, many more wonderful websites devoted to primal recipes, but these are the ones I find myself going back to most often. I hope they will convince you that Paleo can be delicious!